beginning of the 15th century and Kaunas revived. It quickly became an important trading centre and a large river port. 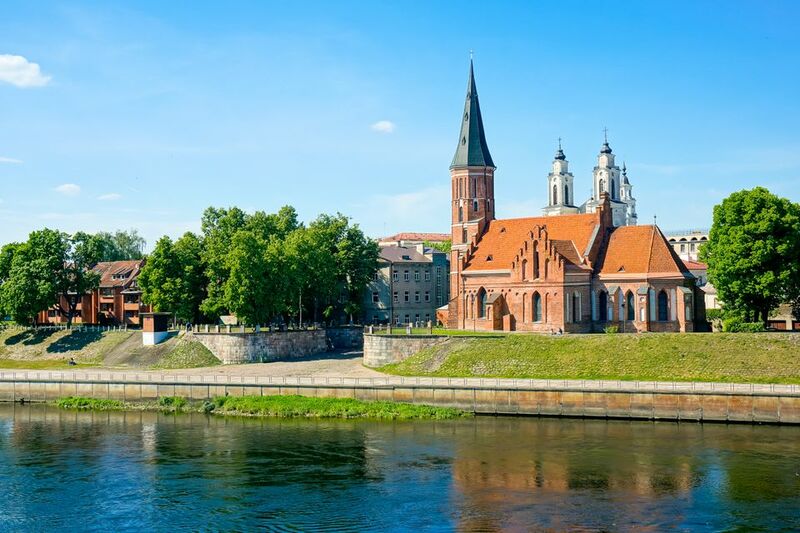 Today, more than 420,000 people live in Kaunas. One reason to love Kaunas is that it is the second most pedestrian-friendly city in Europe (after Venice). Pedestrians dominate the Old Town and the Laivės Alėja, the longest pedestrian zone in Europe—1.7 kilometers long. This zone starts with a somber memorial to Romas Kalanta, a student who burned himself to death in 1972 to protest communism’s oppressive regime. From that monument you can see, at just over a mile away, the end of the pedestrian zone—the grandiose St. Michael the Archangel Church, located on Nepriklausomybės aikštė (Independence Square). If you count the Old Town’s foot-friendly areas (where cars are rare), then the total pedestrian distance is over three kilometers (two miles).